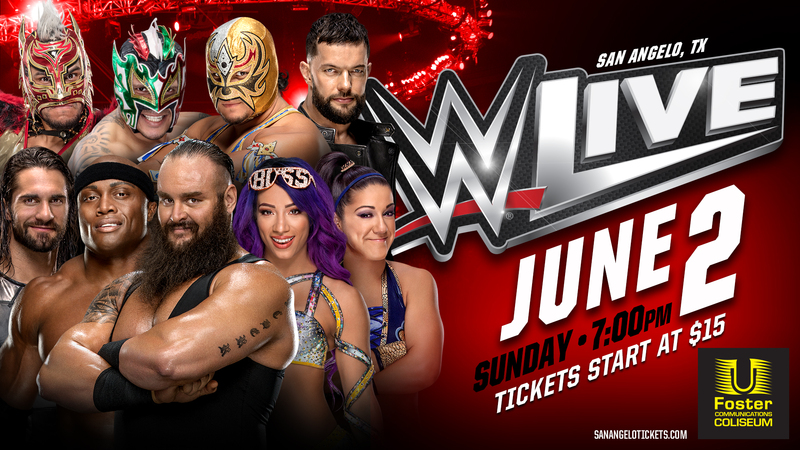 SAN ANGELO, TX – The World Wrestling Entertainment will be making a stop on their tour in San Angelo on June 2. The WWE will be bringing many of their best stars including the New Universal Champion Seth Rollins. He will actually be in a match with Roman Reigns, and Braun Strowman vs Drew McIntyre, Baron Corbin, and Bobby Lashley. Other fighters will be Sasha Banks, Bayley, Finn Balor, and many more. The event will be at the Foster Communications Coliseum starting at 7:00 p.m. You can purchase tickets at Sanangelotickets.com, Blair's Western Wear, and at the Box Office the day of. Tickets start at $15 and tickets will sell fast.